A petrol tanker has caught fire in Nigeria's biggest city, Lagos, killing at least nine people, officials say. More than 50 vehicles, including five buses, were set ablaze after the truck lost control and spilled its contents on a busy motorway during rush hour. #Breakingnews : #update casualty from #Berger tanker explosion may not be as high as earlier speculated (100+). 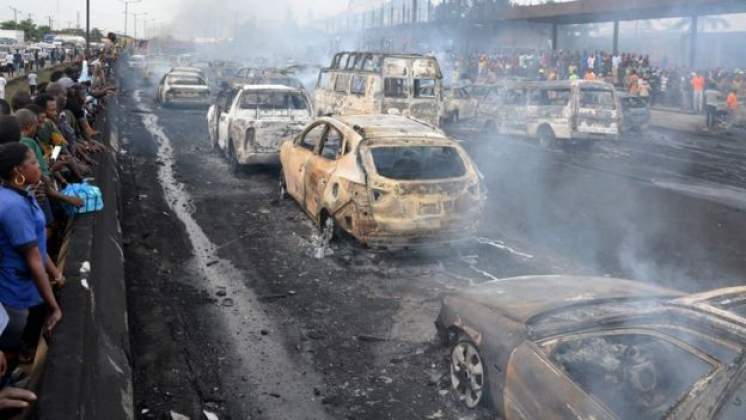 @FRSCNigeria confirms 54 vehicles burnt at fire incident . Fuel explosions are common in Nigeria, Africa's biggest oil producer. Petrol is transported via badly maintained roads and vehicles. A representative from the Federal Road Safety Corp (FRSC) told the BBC that the tanker lost control as it approached a bridge, and ended up falling on its side. Nigeria's President Muhammadu Buhari said he was "very sad to learn of the tragic loss of lives". "Sadly, this seems to be one of the greatest tragedies we have seen in recent times," he said in a statement. Government spokesman Kehinde Bamigbetan said it was time "to find ways of ensuring that tankers are driven by drivers who have more responsibility". "We need to work more with federal agencies so we don't have these crises all the time," he said.